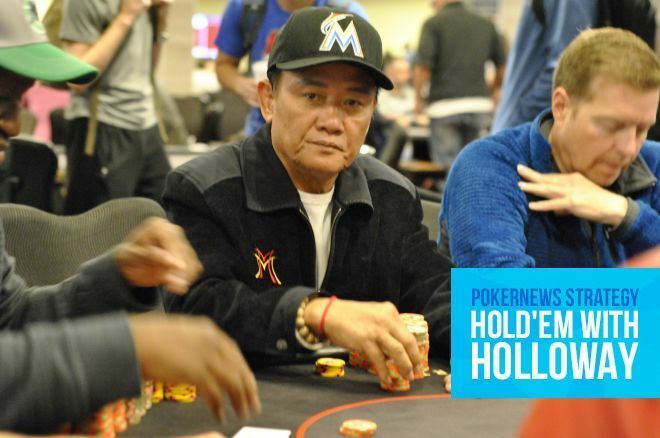 In Hold'em w/ Holloway, Men "The Master" Nguyen had the nuts, and had the second nuts checked back! From October 1-10, I served as an embedded reporter on a goodwill charity mission to Vietnam, one spearheaded by the controversial Men "The Master" Nguyen. I will be writing about that experience in depth in the near future, but before I do, I want to talk about a poker hand I watched play out at California's The Gardens Casino. Before our 12-hour flight across the Pacific, 1996 World Series of Poker bracelet winner Greg Grivas (he won the last Chinese poker event ever held at the WSOP), Nguyen, and I had some time to kill. Seeing as The Gardens is one of Nguyen's favorite places to play, we decided to swing by for some poker. It marked my first visit to the venue, which had recently hosted a WPT event where Nguyen finished third for just over $270K. I'd heard questionable things about the former Hawaiian Gardens property, but a remodel a couple years back must've done wonders as it seemed to be a great place to play poker. There were hundreds of tables complete with amenities, superb food service, a tournament area, and plenty of pit games. It was also cool to see players like the legendary Johnny Chan and bracelet winner Dan Heimiller there grinding it out. Both Grivas and I sat down at a $5/$5 NLHE game while "The Master" jumped into a $12/$24 Omaha Hi-Lo/Big O mixed game. After doubling my $500 buy-in early, I stepped away from my game to go and see what the other two were up to. It was then I witnessed a strange hand involving Nguyen. I didn't catch all the details, but I'll do my best to explain what I saw combined with what Nguyen told me after the fact. The game was Big O, which is played like Omaha Hi-Lo but with five cards instead of four, and Nguyen had raised preflop. I'm not sure how many players called, nor did I catch the flop action, but suffice it to say "Player A" just called preflop and remained in the hand through the flop, which came with two spades. Nguyen: "How can he check back there?" On the turn, which was another , Nguyen bet $24 and Player A raised to $48. Any other players who were involved in the hand folded out by this point. Nguyen, a seven-time WSOP bracelet winner, opted just to call and a completed the board on the river. Instead of relating the river action right now, I'm going to let you in on what the two players held. Player A, who hadn't raised preflop, held for aces full of tens, the second nuts. Meanwhile, Nguyen had for quad tens. He'd gotten lucky as his set was no good on the flop, but he turned the one-outer. Nguyen would later tell me he just called Player A's raise on the turn with the plan of check-raising the river. That seemed like a reasonable course of action. True to form, Nguyen checked the river... and then Player A checked behind! That's right, he checked the second nuts last to act. "I thought there was enough in the pot," Player A explained after the hands had been tabled and Nguyen couldn't believe his opponent didn't bet. I was similarly stunned from the sidelines. Had I been in Player A's shoes, I'd bet $24 on the river 100 percent of the time. There's just too much of a chance Nguyen has either a straight or an inferior full house and will pay me off. If I were to get check-raised, I'd then call and be out another $24. To be honest, I think a lot of players, myself included, might even consider putting in a three-bet to the check-raise. After all, there's just one hand that beats us. Of course, when we're clicked back by the four-bet we'd ascertain there's a good chance our opponent has the tens, but if it's me I still pay it off. Then again, my whole "it's just one more bet" mentality is why I'm not a good limit player. Later on at the airport, Nguyen and I had a conversation about the hand. He didn't realize I'd witnessed it go down and was excited to have someone to vent to. "How can he check back there?" Nguyen asked. I was wondering the same thing.